There’s no better way to kick off the fall season than buying a new coat, right? While you may have a few standbys in your closet from past seasons, it’s always a good time for an upgrade—especially if what’s hanging in your arsenal is a wee bit dated. To give you a sense of what coats are in and out this autumn, we hit up industry experts from some of our favorite retailers, like Shopbop and Nordstrom, to spill. Keep scrolling to peep (and shop!) the coveralls you need to be slipping into when the leaves start changing. "Colorful faux fur is in and menswear-influenced shapes, whether they are more oversized or stripped down to look more feminine and simplified." ​"Black is out; navy blue is in! Replace your black coat with a color. Olive is another good one that can be worn with almost anything." "The one good thing about summer ending: coat season! I can’t wait to start wearing menswear-inspired styles. Boxy overcoats and dusters in prints like houndstooth, pinstripes, and plaids really do look cool thrown over anything. It’s 95 degrees outside, but I’m already stocking up." "The big coat that we will undoubtedly be seeing on the most stylish back this coming fashion month is the long double-breasted coat. The longer silhouette is key for the season ahead, and bonus points for oversized button detailing as seen on the below striking Ellery coat. Plus, the English heritage fabrics are back with a vengeance for fall." “I love the cinched-waist coats championed at Alexander McQueen. After so many seasons of cocooning proportions, the updated hourglass silhouette feels suddenly fresh and modern, while the rich treatments lend a touch of drama to daytime dressing. I’ll wear mine with over-the-knee boots and a cashmere turtleneck." 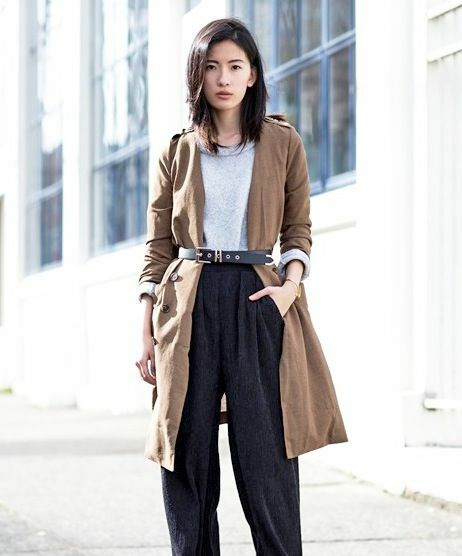 What is your favorite fall coat trend? Let us know your thoughts in the comments below!